This rice bowl is a perfect lunch for one hungry freelancer. 🙂 Feel free to scale up the quantities if you’re not dining alone! I used turkey stock, which was amazing, but of course you could use any other stock you prefer. Combine the rice and stock in a small saucepan and bring to a boil. Reduce the heat to low and simmer, covered, for 20-25 minutes or as your rice directs. In the last 5 minutes of cooking time, sprinkle the edamame on top of the rice and replace the cover so the edamame will steam. 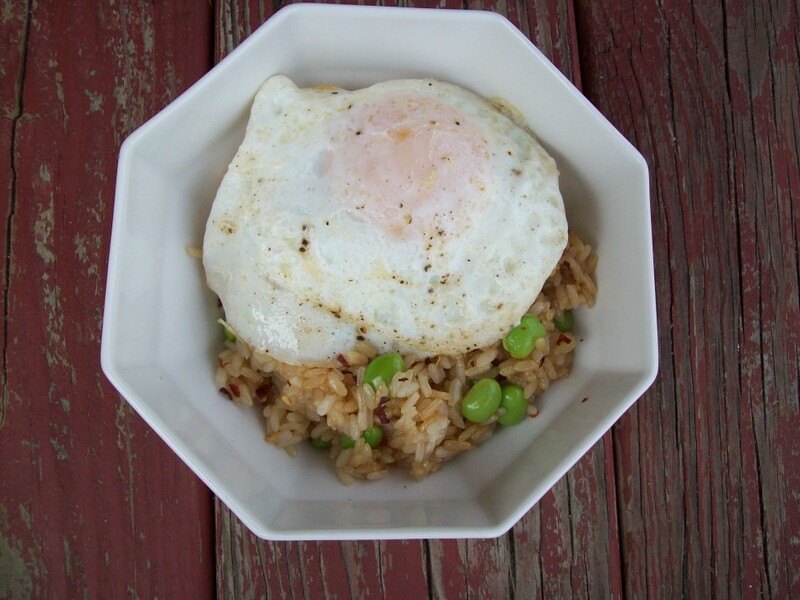 While the edamame are steaming, fry the egg; if you’re not sure how to do that, gently crack a large egg into a hot skillet (you’ll want a little butter or oil in the bottom to prevent sticking). Cook over medium-high heat for 1-2 minutes, until the white is almost completely opaque. Carefully and quickly flip the egg over, being careful not to break the yolk, and turn off the heat. Remove the egg from the pan after about 15 seconds and you should have a fully cooked white and a soft, runny yolk.